To fully appreciate the shifting dynamics of the opioid crisis, we need to understand both the nature of the policies we are implementing as well as their likely short- and long-term effects. Policies can focus on reducing the demand for opioids–for example, by improving access to medication-assisted treatment—or reducing the supply of opioids—for example, by increased monitoring and regulation of opioid prescribing. These policies will have different effects on both the composition of people at risk and short-term mortality rates. Reducing the supply of opioids should reduce the number of people who newly develop opioid use disorders. In the long run, this will likely reduce overdose deaths. In effect, such policies staunch the “flow” of people newly at risk. But it does not address the risk faced by people who already have the disorder—the “stock” of people now at greatest risk for overdoses. In the absence of strategies to reduce the demand for opioids, curbing the supply of prescription opioids may actually lead to increased deaths in this group from their substitution towards illegal, more dangerous substances. And that is exactly what we are seeing. Heroin and synthetic opioids, such as fentanyl, are driving much of the persistent and dramatic rise in opioid deaths. Since 2010, heroin deaths more than quintupled, from 3,000 to over 15,000, and deaths from synthetic opioids (such as fentanyl) increased nine-fold, from 3,000 to over 28,000. 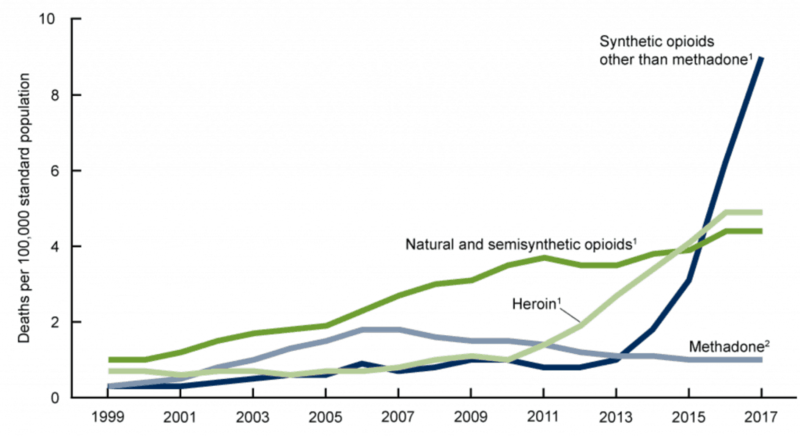 Meanwhile, overdose death rates from natural and semi-synthetic opioids (OxyContin) have risen modestly or even plateaued. Source: National Center for Health Statistics, NCHS Data Brief No. 329, November 2018. Two recent studies help us understand these dynamics. In the American Economic Journal: Economic Policy, LDI Senior Fellow Abby Alpert, David Powell, and Rosalie Liccardo Pacula evaluated the effects of a reformulated, abuse-deterrent version of OxyContin released in 2010 – a supply-side intervention – on death rates involving opioids. The details of this study can be found in an earlier blog post; to summarize, the authors leveraged state variation in OxyContin abuse before the national introduction of the reformulated drug to estimate the substitution effect towards synthetic opioids and heroin. While there was no correlation between heroin deaths and OxyContin misuse across states before reformulation of the drug, states with the highest initial rates of OxyContin misuse experienced the largest increases in heroin deaths after reformulation. Controlling for confounders such as the use of other pain relievers and state policies (such as prescription drug monitoring programs, or PDMPs), the study suggests a strong substitution effect: heroin deaths rose after OxyContin became more difficult to abuse. They find suggestive evidence that fentanyl deaths also increased as a result of reformulation. The effect wiped out any gains from reduced OxyContin overdoses. Rather than reduce overall mortality, OxyContin reformulation shifted deaths from one drug to another. A recent study by Allison Pitt, Keith Humphreys, and Margaret Brandeau builds on this literature to model the differential effects of 11 different policy responses to the opioid epidemic. The authors divided the US population according to age and pain status, modeled substance abuse and overdose prevalence, and estimated different paths towards recovery or overdose deaths under different intervention scenarios. The model found that over a five-year timeline, demand-focused interventions, such as increasing naloxone availability, promoting needle exchanges, expanding medication-assisted treatment, and increasing psychosocial treatment increase quality-adjusted life years and reduce deaths without causing drug substitutions. In contrast, policies that reduce opioid supply, such as rescheduling, reformulating, and PDMPs, increase overall deaths because of a substitution effect with heroin. Over a longer timeline of ten years, the decrease in new cases due to supply restrictions begin to chip away at overall opioid mortality, but no single policy has a dramatic effect on overall deaths over five to ten years. What can we make of these sobering models and studies? It is still possible that over the long-run federal and state policies to restrict the supply of opioids will reduce opioid use. But it is clear that these supply-side policies alone will not reduce the body count in this epidemic in the next few years. A holistic and effective approach requires renewed attention to the disorder itself, including increased access to, and funding for, evidence-based treatments. But as Pitt, Humphreys, and Brandeau note, “no epidemic has ever been averted solely by treating affected cases.” These and other studies point to the need for a multi-pronged strategy that prevents and treats opioid use disorder, and mitigates its deadly effects.